This price includes all taxation and full Postage and Packing rates. 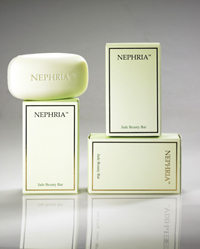 The Nephria Jade Beauty Bar is the world's most luxurious and expensive Beauty Bar, made with real Jade. With unique ingredients, including Nephrite Jade, together with pure oils from apricot, olive and jojoba, the Nephria Jade Beauty Bar cleanses, revitalises, rejuvenates and reinvigorates the skin and complexion, reducing the signs of ageing. The Jade Beauty Bar also contains Vitamin E, a powerful antioxidant, protecting the cells from free radicals and helping the skin to look younger. Nephria - made with the finest Nephrite Jade. With unique ingredients, including Nephrite (Jade powder), together with pure oils from apricot, olive and jojoba, the Nephria Jade Beauty Bar cleanses, revitalises, rejuvenates and reinvigorates the skin and complexion. Containing Chitosan, which in cosmetic products is cherished for its highly effective moisturising factors, it helps to reduce the skin from showing signs of ageing. The Bar also contains substantial amounts of Vitamin E, which is a powerful antioxidant, protecting the cells from free radicals, which can cause damage. Vitamin E is also used to great effect for skin treatments in helping the skin look younger. - calming debilitating skin problems such as inflammation and acne. Il prezzo include tutte le tasse e spese di spedizione e imballaggio. Il sapone di bellezza Nephria Jade Bar è il sapone più lussuoso del mondo, di una stravagante e squisita bellezza, elaborato con nefrìte. Costituito con ingredienti unici come nefrite (Giada in polvere), e puro olio di albicocca, di jojoba e di oliva, il Beauty Bar Nephria Jade purifica, rivitalizza, rigenera la pelle e ravviva la carnagione. Contenendo Chitosan, che nei prodotti cosmetici è noto per la sua efficacia idratante, che aiuta a ridurre i segni di invecchiamento della pelle. Il sapone di bellezza contiene anche una notevole quantità di vitamina E, che è un potente antiossidante, proteggendo le cellule dai radicali liberi che possono causare danni. La vitamina E viene anche utilizzata per il trattamento della pelle per dare un aspetto giovanile. - Attenua i problemi di pelle come l'infiammazione e l'acne.